Does anyone know what kind of birds these are? I'm in Ontario and have lived in my neighbourhood for 9 yrs and have never seen them. There are 2 pictures, but there was a third bird I could not get a picture of, it was like the yellow one but orange and black. Comments for What kind of bird? I live in Wiarton, Ontario, and have them all the time on my property. It is a Goldfinch, they just turn a darker color during the winter. Male Balimore Oriole and Rose-breasted Grosbeak. 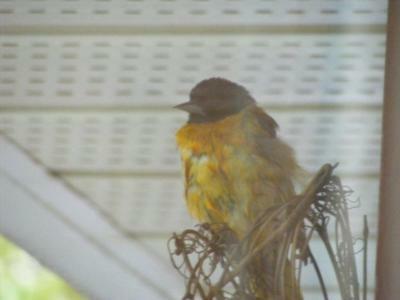 I live in the GTA and had a Grosbeak two years ago and last year an Oriole. The black and white with red is definitely a Gross Beak and the other one looks like a young Baltimore Oriole, but can't be sure on that one. 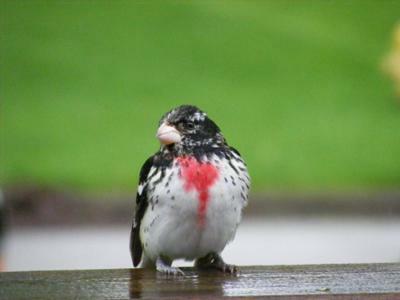 The black, white and red one looks like a Rose Breasted Grosbeak. That's an American Goldfinch I think. - the orange and black one, that is!